When you create a TikTok profile, you decide if you'd like that profile to be public or private. Private profiles limit your videos to just the people you've chosen to let follow you, while public accounts let you share your videos with the world. But what about the comments people leave on your content? As part of our commitment to empowering users to take control of their TikTok experience, we recently added new features that let you control what people can or can't say on your videos. 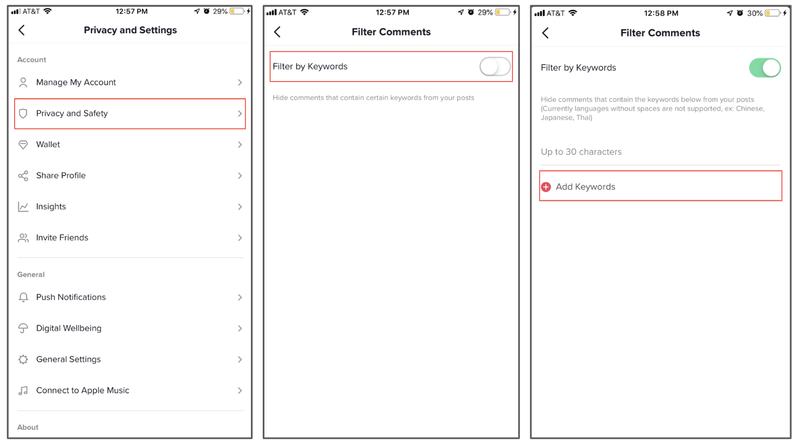 From filters to moderators, we do a lot on our end to minimize the opportunity for misuse on TikTok, but we're also focused on building you tools and settings that let you take control of your own feed. For example, we understand that there are words some people may view as harmless but others perceive as harmful – so we created a "Filter Comments" tool that allows you to make a custom list of keywords that will be automatically blocked from any comments on your videos. 2. Tap "Privacy and Safety"
4. Tap the toggle to enable > tap "Add Keywords"
5. Choose your keywords and tap "done"
Once set, all comments with a keyword on your list will be removed from the videos you post, meaning they won't appear to you or anyone else. This includes comments that have already been made and any comments going forward. TikTok also gives you the power you to choose who is allowed to comment on your videos. You can let anyone comment, restrict it to friends, or turn off comments completely. Tap "Who Can Comment on My Videos"
Don't forget, if there are any comments that violate our community guidelines, you can report them. To report a comment, tap on it and follow the steps as prompted. TikTok is committed to building tools that give you control of your TikTok experience. With comment filters, you're in charge of what people can contribute on the videos you create. You can also report any comment that violates our community guidelines. To report a comment, tap on it and follow the steps as prompted.